Do you want to create deeplinks in your WordPress gallery? With the deeplinking addon, you can link to any image in your gallery uniquely, providing you with easy URLs for your visitors or clients. When you create a deeplinking WordPress gallery, you have an indexible URL for SEO, and it allows you to easily query an image in your gallery using hashes. The Deeplinking addon is available for all those with a Pro or Ultimate license. In this guide, you will learn how to deeplink your gallery images to boost your WordPress SEO. Just follow these three short steps! We’ve created a video that can help you activate deeplinking. If you don’t want to watch the video walkthrough, continue reading the steps below. First you should install Envira Gallery. Without a plugin, WordPress doesn’t support this sort of functionality for galleries, so you’ll need a plugin like Envira. Don’t worry; our installation guide makes it easy to get the plugin set up! Just remember, you need the Pro license or better to enable gallery deeplinking. Now follow our guide on how to verify your license so you can turn on deeplinking. Next, you need to install and activate the Deeplinking addon. 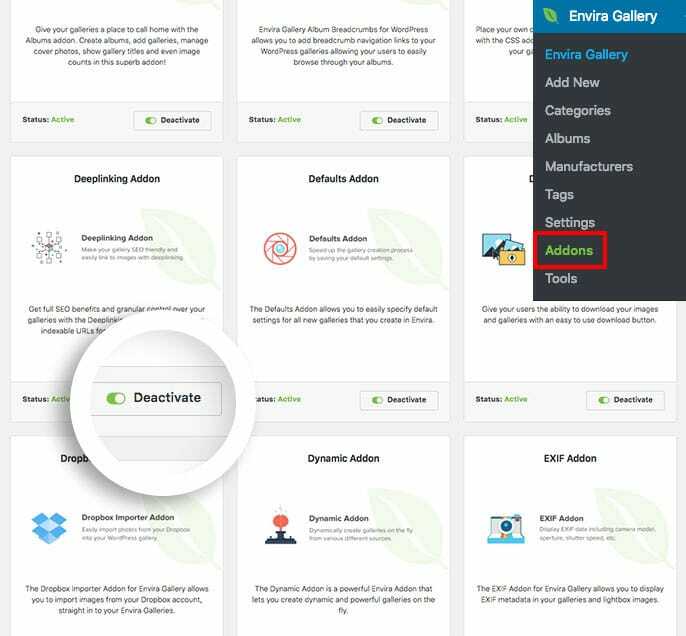 Go to Envira Gallery » Addons and find Deeplinking in the list of available addons. Activate it! You are now ready to enable deeplinking for your gallery. Choose the Envira Gallery that you want to have deeplinking enabled on and go to the Lightbox tab. Scroll to the bottom and you will see Enable Deeplinking; check that box. With that checked, all that is left is for you to Publish or Update your slider. Then add your gallery to a post or page if you have not yet done so. Finally, check out your gallery’s new links! Great work! You just created a deeplinking WordPress gallery using Envira Gallery! We hope our tutorial helped you out. Now why not read through some of our other gallery guides? You might learn something new about SEO!